My order came in yesterday! I got little flat shells and put each of the 5-6 things on a separate one and left for 5-6 hours. When I came home they were all tipped upside down and empty! My crabs loved it! Thanks! Mega Protein Mix - 7 different seafood and insects! Wodesorel's Potpourri Mix ( 'Wo'-pourri' ) - 10 different kinds of flower blossoms! I see that you only have Domino and Cave roaches available this year, I was wondering if you may have Halloween Hissers available next year? Amazilia wrote: I see that you only have Domino and Cave roaches available this year, I was wondering if you may have Halloween Hissers available next year? I lost the entire colony. Something has been up with just the hissers and I'm not sure what happened, but the Halloweens were the worst off and they all faded. The other three species I put out on the front porch a month ago and let them have fresh air and real sunlight, and it seems to have helped. Wish I had thought to do that sooner as the Halloweens may have made it. The Flat Horns seem to have stabilized completely. The Hybrids and Wide Horns got thrown together because they were both doing so poorly. I'm still on the fence on if they'll be able to recover, but there's still a few more weeks before the weather gets cold and I have to bring them back in. There are some great roach breeders out there. PM me if you want some names. O my gosh i never thought i'd say this but those domino roaches are SO CUTE! Can they live w hermies like rollypolys? YYWW wrote: O my gosh i never thought i'd say this but those domino roaches are SO CUTE! Can they live w hermies like rollypolys? Uhh... never thought about it before. They are harmless and they will eat anything they can find, so in that respect they would work the same as rolly pollies. (Their poo is also really nice - I used their old bedding for all my potted plants this year and got really good growth.) The adults however have a bad way of drowning in open water, which is a problem in crab tanks. They also climb glass, so they have to be restrained with a Vaseline barrier, which would be trouble if the crabs can get to the top of the tank because oil and crabs is not a good combination. In the right set-up it could work, but for a normal crabitat it would be a challenge. I want to apologize to everyone who has been waiting. I had no idea that the stuff we've been selling was so popular! I am working on getting things restarted. There's some coding that needs to be done on the store website before it's operational again. There's also a lot of packing that needs to be done with the garden items. We've had a lot happen in the last few months, and unfortunately the store is not our primary job. Between family issues, health issues, mechanical issues, kitty problems, and technical problems we've fallen far behind where we had hoped to be on the store. We're spending time every day getting caught up and while I can't say for sure when everything will be done, we're hoping it will only be a few more weeks. I very much want to have everything ready to go before Christmas! Since people have been asking about why the store has been closed for so long - I have an autonomic nervous system disorder that on bad days makes me extremely dizzy and foggy and at risk for passing out whenever I'm sitting up or standing. Usually there's many more good days than bad and while I'm slow at getting things done, they do get done. For some reason the last four months have been almost nothing but bad days. When I do have a good day it's spent cleaning our home and taking care of our many pets. Every single time I get caught up with that and am ready to start in on store work, I'm stuck back down again! And then as if to add insult to injury, my back started acting up to the point where I can not sit or bend without extreme pain. Right now the doctor is waiting on some tests before assigning physical therapy, so that issue will be getting taken care of, hopefully before planting time in the spring! I'm not looking for sympathy with this post. I've been dealing with this for years now, and it is what it is. However, I do want to explain why things aren't moving along with the store like I'm sure everyone has been expecting it to. All of our product has been deep frozen, so when we do open it'll be fresh as the day it was dried. Believe when I say that it is nothing but frustration here that I can't be doing these things! I love my little store and I'm very proud of it. I also love how loyal our customers are, and that our foods are so enjoyed by everyone's hermits. We will be back - I can't say for sure when - but I'm not giving up on this! Take your time! We all love your store and will be patiently waiting when ever that time is right! I think you're completely justified in having the store on hiatus! Take care of yourself. I've been rationing the foods I've gotten from you so I don't have any riots in the tank, and I think we're all (patiently) looking forward to you re-opening! Crabbing since July 2014! 75 gallon with 12 Purple Pinchers. I second what Breezy and Meg said...take care of you before worrying about US! P.S. 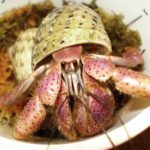 I think your knowledge and experience are invaluable to many a new crab owner, myself included, so you are saving little crabby lives every day. wodesorel wrote: Since people have been asking about why the store has been closed for so long - I have an autonomic nervous system disorder that on bad days makes me extremely dizzy and foggy and at risk for passing out whenever I'm sitting up or standing. Usually there's many more good days than bad and while I'm slow at getting things done, they do get done. For some reason the last four months have been almost nothing but bad days. When I do have a good day it's spent cleaning our home and taking care of our many pets. Every single time I get caught up with that and am ready to start in on store work, I'm stuck back down again! And then as if to add insult to injury, my back started acting up to the point where I can not sit or bend without extreme pain. Right now the doctor is waiting on some tests before assigning physical therapy, so that issue will be getting taken care of, hopefully before planting time in the spring! Where can I find the link for the Amazon Store? I can also add anything you're looking for if it' not listed. Just PM me a link.